My first sighting of an Indian Pitta was in the compound of forest rest house at Sitanadi Wildlife Sanctuary, Chhatisgarh in 2004. This was the time when my interest developed in photographing the birds as most of the wildlife sanctuaries and national parks are closed for more than 3 months during monsoons. Although I got few good shots at Tadoba in my various visits to the park but my thirst was quenched to a certain extent on 30th of June 2015 at Sariska Tiger Reserve in Rajasthan, where I got good shots of this bird indulged in nest building on a tree at eye level. 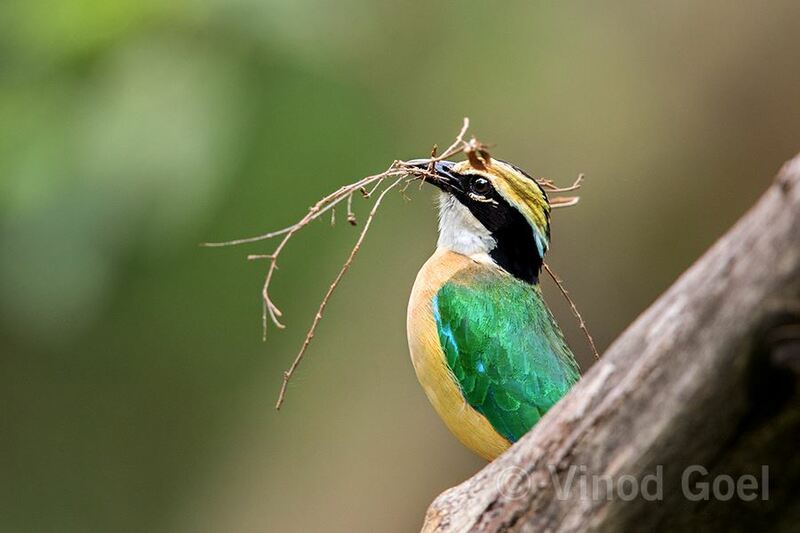 The name “Pitta” is derived from Telegu language word ‘pitta” which means a small bird.. As far as Indian sub-continent is concerned there are 4 types of Pittas namely Indian pitta, fairy pitta, mangrove pitta and blue-winged pitta. This bird possessing nine different colors is also called ‘Navrang”.To me it is a nine colored jewel. Number 9 has importance in Indian psyche from time immemorial. There are 9 manifestations of God Vishnu which have already come into existence, 9 manifestations of Goddess Durga, 9 planets in the universe. We also know that there is 9-month gestation period for the birth of human beings and the holy cow. There are 9 Puranas and 108 Maha Puran. Mahabharat and The Holy book Gita has 18 chapters each. Bhagwat Gita also has total of 10800 shlokas . We human beings have 9 openings in our body. Readers may recall that every important number when summed up ends to a number 9. Let us enjoy the beautiful colors of this magnificent bird and make our life more colorful. Image from Sariska Tiger Reserve on 30th June 2015.